Ovarian Cancer Research Fund’s 20th Anniversary Legends Gala, Hosted by Harry Connick Jr. The Ovarian Cancer Research Fund (OCRF) celebrated it’s 20th anniversary with the Legends Gala on Wednesday, November 5th at The Pierre in New York. This glamorous evening united the business, philanthropy, fashion, media and entertainment industries behind the important cause and together raise money toward the much-needed funds for ovarian cancer research. Hosted by actor Harry Connick, Jr., who had the crowd roaring with his jokes on stage, the event honored legendary leaders of today. 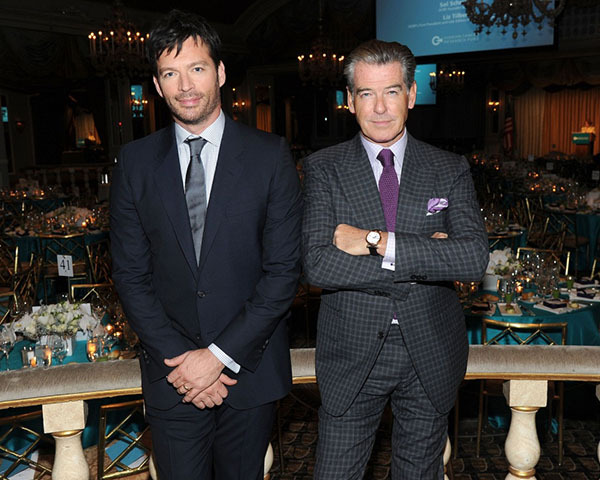 Actor and philanthropist Pierce Brosnan, was honored with The OCRF Legends Award. Brosnan, who lost his daughter, Charlotte, to the disease last year as well as his first wife, delivered a beautiful speech to a standing ovation, putting support behind OCRF’s research and efforts to eradicate ovarian cancer. Chris Salgardo, President of Kiehl’s Since 1851, was on-hand to accept The OCRF Hope Award, while the Janet Burros Memorial Foundation was honored with The Liz Tilberis Humanitarian Award, accepted by Mara Burros Sandler, Ricky Sandler, Chet Burros and Claudia Burros. The event program also payed tributes to the legendary Liz Tilberis, former OCRF President and Editor-In-Chief of Harper’s Bazaar, who galvanized the worlds of fashion, beauty, and entertainment, and OCRF Founder & Chair Sol Schreiber. The beautiful gala included a cocktail reception, luxury silent auction and dinner, enjoyed by guests including Victor Garber, Taryn Manning, Kelly Rutherford, Joe Zee & Rob Younkers, Analeigh Tipton, Tinsley Mortimer, Dionne Warwick and Arianna Rockerfeller. Lisa Lampanelli, comedian for The Venetian Las Vegas’ newly branded all-female resident comedy series “LIPSHTICK – The Perfect Shade of Stand-Up”, also dazzled the crowd with a brief comedy break between speeches. Ovarian Cancer Research Fund will continue to benefit research into early detection and ultimately a cure for ovarian cancer. 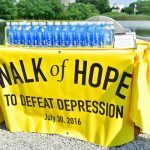 In support of its mission, OCRF assists patients and their loved ones to understand the disease and its treatment, and provides outreach programs to raise public awareness of ovarian cancer. Since 1998, OCRF has awarded over $60 million in grants to 237 of the brightest women and men working in the field of cancer research at over 70 of the leading medical centers in the United States.